Roland have been producing sampling groovebox products for a decade or so now, and until recently have primarily been aiming these at the dance market. 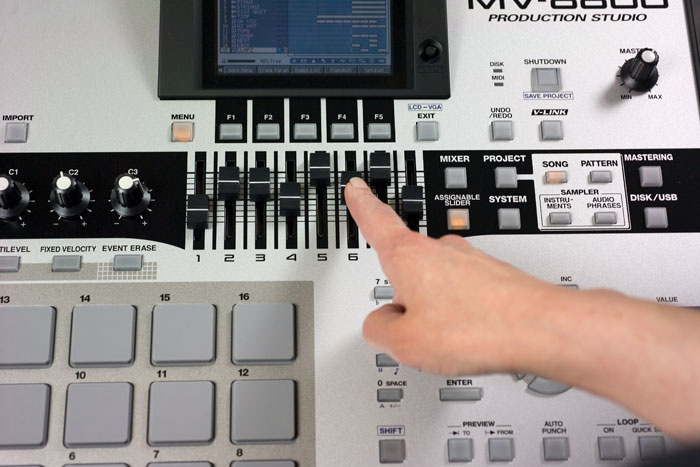 However, in the last few years hip-hop producers have hit the big time, commercially speaking, revitalising the market for one of their favoured tools, the Akai MPC series, and Roland are now sensibly angling for a piece of this action. Roland's first direct challenge to Akai back in 2003 was the MV8000, which moved away from the D-Beam-enhanced twiddliness of the grooveboxes towards a more stripped-back combination of sequencer, sampler and 16 'Have we met somewhere before?' velocity-sensitive rubber trigger-pads. Since then, this unit has been refined into the latest MV8800. The new unit combines sampling and audio recording with a specially designed sequencer which integrates audio and MIDI recording and editing functions and which operates in both drum-machine-style Pattern Mode and linear Song Mode. All audio from the machine passes through an internal digital mixer, complete with three effects processors, and you can mix down and master entirely within the box. Mastered mixes can then be burnt to the internal CD drive in data CD-ROM or audio CD formats. All these facilities can be accessed via the MV8800's colour LCD display, in conjunction with the wide variety of clearly laid-out hardware controls on the unit's top panel, although further viewing and editing possibilities can also be brought into play by connecting an additional monitor and mouse. All work in the MV8800 is carried out within a Project, and you can have as many Projects as will fit onto the supplied 40GB internal hard drive. A Project may contain up to 16 different Songs, each comprising up to 128 MIDI tracks, eight audio tracks, and one additional track from which you can trigger user-programmable Patterns. A Pattern can itself have up to 64 MIDI tracks and one audio track, so it's pretty much like a Song in miniature, but by programming different sections of your track into different Patterns (you can store 500) you can easily experiment with different song structures. The heart of the MV8800 is its sampling engine, a 64-voice beast working at 16-bit/44.1kHz resolution and capable of addressing up to 512MB of RAM. This drives not only a traditional 16-part sampler, but also up to nine stereo audio tracks. In this context, 64 voices of polyphony might not go as far as you think, and RAM is also eaten up pretty quickly, because the audio tracks are recorded to and played back from RAM, not hard disk. I'd probably consider 512MB RAM an essential upgrade from the supplied 128Mb. The main sampler is where you'll normally create the bulk of any given production (at least, judging by my experience and the construction of Roland's demo songs). Each Song file in the Project has its own complete sampler setup made up of 16 Parts, each containing a Patch that stores all the information about sample assignments and playback settings. Up to 128 Patches can be stored in the Project's library for quick access from any Song, and you can also archive Patches to disk directly. This is the screen of Partial parameters relating to the Partial's filter setup. The flexible multi-stage envelope generator, velocity sensitivity settings and keyboard-tracking options provide a great deal of sound-design potential.Within the Patch, samples are assigned to MIDI notes via a system of Partials. Each Partial has a Sample Mix Table into which up to four samples can be loaded, and the Partial can then be set to respond to any range of MIDI notes from A0 to G#8. You can have 96 separate Partials in a Patch (one for each of the available MIDI notes), but you can't overlap or crossfade them. Each sample in the Table has independent level, pan, tuning and velocity-response controls, and you have a lot of freedom to set up layered, velocity-switched and velocity-crossfaded Patches. The output of the Sample Mix Table runs through a filter and an amplifier on its way to the MV8800's mixer. The filter offers low-pass, high-pass or band-pass responses and can be nicely savage at high resonance settings. Velocity and keyboard-tracking options are provided, as well as an excellent multi-stage envelope generator which can also control the Partial's pitch. The amplifier has velocity and keyboard-tracking options too, and a similarly well-specified envelope generator. 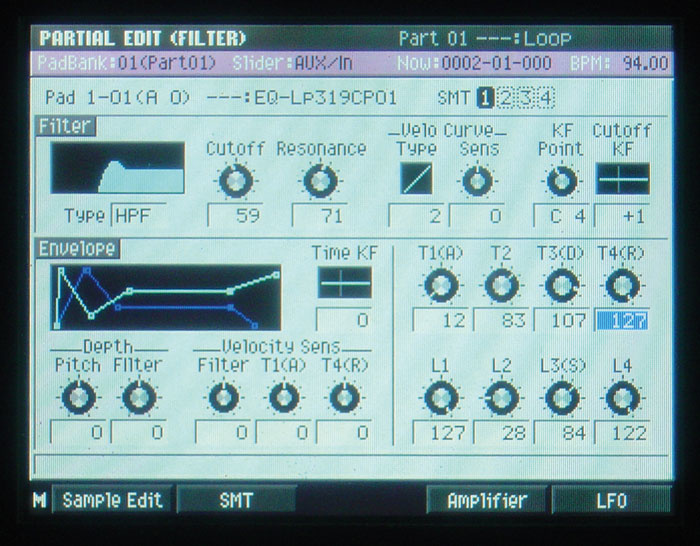 A single LFO per Partial will modulate pitch, filter cut-off, level, and/or pan, and the usual waveforms are available: sine, triangle, sawtooth, square and sample & hold. Although a Key Sync switch is provided, I found the lack of a waveform phase control a bit tedious, especially as the square and sawtooth waves didn't start where I'd expected them to. A further useful option is the non-cyclic Bend Up/Down waveform — basically a two-stage AD envelope generator delivering a single positive or negative modulation pulse, before returning to zero modulation. MIDI pitch-bend, aftertouch and modulation messages, plus one other user-defined Continuous Controller, can be used to modulate pitch, filter cutoff and level (or the LFO modulation depth for these) as well as LFO rate. Mono, legato and portamento parameters give pretty comprehensive control, and there are one-shot and mute-group settings for use with drum-hit samples. The pads do a good job of speeding up navigation through the forest of Patch parameters. 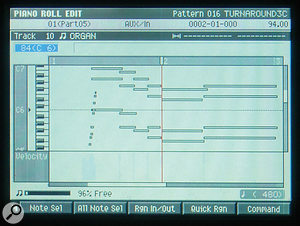 For example, holding down the Quick Edit button and pressing any pad (or a key on a connected MIDI keyboard) immediately accesses that Partial's editing screens, while the Clip Board and Delete buttons make light work of copying Partial settings between pads and removing Partials you no longer require. I've always felt that Roland gear is particularly strong on effects processing, and the MV8800 is no exception. Of the three internal effects processors, two are global send-return effects: the first offers a choice of chorus or delay algorithms and the second can provide one of four different reverb algorithms. These are all of respectable quality and serve their purpose well at the mix. By far the most interesting effects facilities are offered by the third internal effects processor, the MFX multi-effects engine, which is dedicated to providing insert effects. Here Roland have used their physical-modelling COSM technology to create a wide range of colourful and creative algorithms — a sensible move for the hip-hop market, where character almost always overrides fidelity. So, for example, you'll find not one, but four main delays: one RE201 tape-delay emulation, one tempo-sync'd digital delay, one delay using Roland's funky RSS psychoacoustic 3D encoding, and one emulation of a Boss analogue delay pedal. Then there are Roland SBF325, Boss BF2, Boss HF2 and digital flangers; Roland SDD320, Boss CE1 and digital chorus processors; an '80s-vintage phaser; stereo auto-wah, pitch-shifting and gated reverb; a 10-band vocoder and a gender-bending vocal transormer; a DJ-style vocal canceller, band-killer and resonant filter; and simulations of analogue distortion pedals, radios, turntables, microphones and lo-fi A-D/D-A convertors. But that's not to say that the MFX engine doesn't include more standard algorithms for run-of-the-mill processing tasks: EQ, compression, limiting, noise-reduction, de-essing and psychoacoustic enhancement are all available and of high quality. Another creative facet of the MFX processor is that you can control some of its parameters over MIDI. 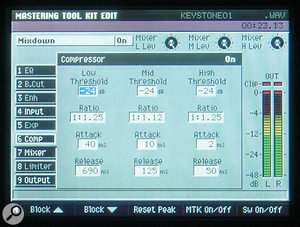 Effect algorithms on all the internal effects processors can have any three parameters adjusted from the C1, C2 and C3 hardware rotary controls, but for the MFX processor you can record these knob movements as MIDI Continuous Controller messages, and thereby create all manner of dynamically changing effects. The piece de resistance, however, is that there is also an MFX algorithm for a fully functioning analogue-modelling bass synth. This combines two oscillators (with cross modulation), noise source, ring modulator, multi-mode filter, two envelope generators, a tempo-sync'd LFO and delay and chorus effects. Given Roland's track record with modelling synths, it's not surprising that it sounds pretty good, and the best thing of all is that it has an external input, so you can run audio tracks (or even your whole mix) through the synth architecture while automating filtering or ring-modulation parameters from a MIDI track. The cherry on the top of all this is that it's really easy to record and resample through the MFX processor, so you can experiment with lots of different processed versions of your samples — another good reason for having lots of RAM installed. I found that this went some way towards working around the fairly basic mixer facilities, too, because I could apply compression (or whatever) and then resample the result to free up the MFX block for another task. You can insert MFX into the Aux channels and master output as well, which is great for bus-processing applications. The possibilities are simply enormous, and Roland deserve considerable credit for wringing so much potential out of the available DSP. There are lots of ways to get samples into the MV8800 for use within your Patches. WAV files can be ripped from any audio CD, with an Auto Divide function taking the sting out of splitting up streams of short hits. WAV and AIFF files are easily imported from CD-ROM, or alternatively by connecting the MV8800 to a USB-equipped computer and dragging files across inside Windows. It's not surprising that the MV8800 can also import Akai S1000, S3000, MPC2000 and MPC2000XL program and sample data, but Roland S700 users will also find their libraries to be readable. Assuming you're silly enough to record your own samples (Who do you think you are? Some kind of creative artist? ), you can connect sound sources via a dedicated stereo pair of turntable inputs (correctly equalised and with a neighbouring earth terminal) and a pair of balanced TRS mic/line sockets. Plugging into the mic/line inputs defeats the phono inputs, which is a shame, because it would have been much more convenient to leave both inputs plugged up and then select between them in the software. It's also a bit of an oversight, in my opinion, that there's no phantom-powered XLR input for condenser mics, given that vocals are the first thing most musicians will be wanting to record into an audio track alongside their programmed parts. Still, the preamp seemed to be fairly clean and quiet with a decent dynamic mic, so it should be fine for demos and scratch vocals. 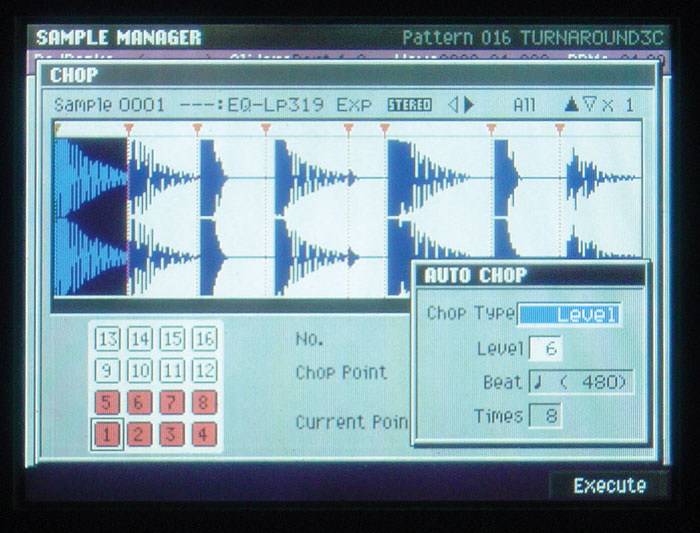 The MV8800's Auto Chop facility mimics the basic operation of software such as ReCycle, chopping up drum loops into hits based on an automatic level-detection routine. However, as you can see particularly on the fourth and eighth slices here, Auto Chop sometimes slices significantly before the actual hit.Once your sound source is connected, you can press the Sampling button to see level meters and adjust the analogue preamps' Sensitivity knobs appropriately. You can select mono or stereo recording, set up level-dependent triggering, and route the inputs through the internal multi-effects before they are recorded. It's also possible to resample the MV8800's outputs from this screen, again with effects processing in-line if you like, for which there are two other sensible auto-triggering options: recording when you hit a pad or when you press the Play transport control. There are a couple of routines designed to ease the initial process of Patch creation from imported and recorded samples. The first lets you assign a number of samples in bulk to consecutive MIDI note numbers, which is ideal for fistfuls of one-shot drum samples. The other option speeds up chopping sampled loops into a number of slices. The simplest facility snips the loop into a number of equal-length sections — something I've encountered on a number of hardware units — but there is also a level-sensing Auto Chop mode which, to some extent, mimics the action of software like ReCycle. Having said that, it doesn't respond particularly well in my experience, often slicing at a point several hundred samples before the appropriate spot. Fortunately, you can edit the slice points manually, too, and perfect things by ear. I particularly like that you're able to select slices directly from the pads while in this editing screen — that really speeds things up. A maximum of 96 slices are available, and you can automatically map them to a Patch when you're finished editing. Once samples are assigned to a Patch, you can edit their start, end and loop points, and select from several loop and reverse-playback modes. A number of common editing procedures are on hand as well, if you need them, including Normalise, Time Stretch, Truncate, Set Mono, Delete and Fade In/Out. If all of that Patch-creation nonsense sounds a bit too much like hard work, you'll be pleased to know that the MV8800's hard disk comes pre-loaded with a Roland Patch library. As you'd have every right to expect, there's a great selection of ready-made bass, drum and percussion Patches, including heaps of the kind of crusty old drum-machine samples that remain so evergreen in hip-hop. However, there are also some great retro-flavoured horns, strings, keyboards and synths, which are great for filling out arrangements around your own samples. This library might allow you to do without an external module for a while, even though its range of sounds isn't enormous. Other Patch folders have acoustic and electric guitars (multisamples and phrases) and vocal one-shots, but I found these a bit hit-and-miss. To start building up a sampled arrangement, you first need to enter either Song or Pattern mode (via dedicated buttons) and create a new MIDI track, assigning its output to the Patch of your choice. 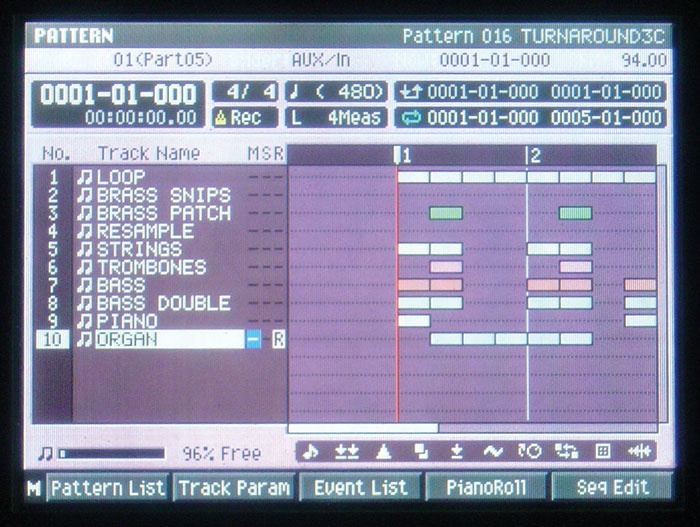 Selecting this track with the cursor keys will then automatically route MIDI messages from the pads and rear-panel MIDI In socket to the chosen Patch. You can adjust tempo in real time from the BPM/Tap key, or set up a more detailed tempo map if you need tempo and time-signature changes. 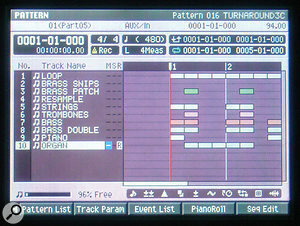 The 16 pads access the sampler's 96 MIDI notes in six banks, and the current bank can be selected via the Pad Banks button conveniently located to the left of the pad matrix. Although the pads are normally velocity sensitive, another couple of keys above them are useful for more accurate control. The Fixed Velocity button locks all the pads to a user-specified velocity setting, while the Multilevel button sets all the pads to output the most recently sent MIDI note, but at 16 different velocity levels. If you choose to record MIDI in step-time mode, a nice zoomable piano-roll display comes up and you can quickly select step note values from the numeric keypad, before playing in the notes or chords you require. Velocity values can either follow those arriving from the pads or MIDI In, or can be fixed, and you can set the duration of input notes as a percentage of the selected step value. Back-step, Tie and Rest buttons are provided via the softkeys beneath the LCD display. 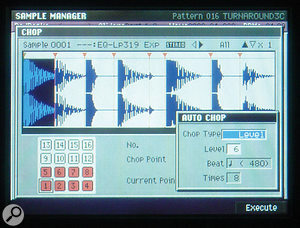 Another method of step-style data entry is available in the form of the Drum Grid, which is ideally suited to one-shot samples such as drum hits. You can split the bar into any number of sub-divisions and then use the pads in conjunction with the cursor keys to enter notes for each sub-division. If you use 16 Notes mode, the cursor keys select a beat sub-division and the pads create any of 16 different notes; whereas if you use 16 Grid mode, the cursor keys select a single note and the pads add notes across a range of 16 sub-divisions. Using the latter at 16th-note resolution is great for quickly trying out different kick or hi-hat parts in Pattern mode. Drum Grid note durations and velocities are set up just as in step-time recording, but the main Value dial comes in handy here as well, as it is automatically assigned to adjust the velocity for the last note you entered. I can see some people liking Drum Grid mode a great deal, but the reality is that most people will simply record in real time when putting tracks together. At any time you can hit Record and Play to begin recording immediately, but if you just press Record on its own you get access to various options relating to count-ins, metronome settings, automatic punch-in/out and input quantisation. These all work fine, and the quantising is quite flexible for a piece of hardware, including Strength and Shuffle options, the latter essential on any unit wanting to match the MPC's Swing function. You don't have to quantise while recording, though, because every MIDI track can have its own real-time playback quantise settings — a big step forward from the off-line quantising procedure of the MPC2500, for example. 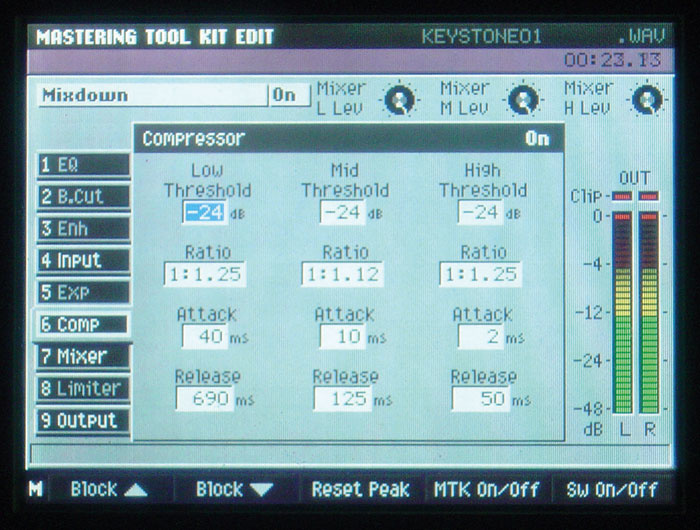 The MV8800 has a nice additional trick up its sleeve here too: quantising templates. These are 71 presets which change timing and velocity data to adjust the groove in some way, and they are grouped into Dance, Fusion, Reggae, Pops, Rhumba and 'Other' sections. The collection of styles seems slightly odd for a hip-hop oriented machine, so I suspect they have been ported from one of Roland's arranger workstations. There's no option to edit them or add your own, but you can control how much the template timing and velocity settings affect the playback of recorded MIDI data, which gives a little more flexibility than you might expect. When you're working on a Pattern or looped section of a Song, you can easily delete notes and re-record them without ever leaving record mode. What makes this possible is the Event Erase button, which you hold down while pressing any pad wherever you want to get rid of data which that pad recorded. This is a very intuitive way to work, because (with a little practice) you can erase events very accurately to refine a particular part, and it's one of the characteristic elements of the MPC formula, so Roland have been sensible to include it here. Press down the Roll button in conjunction with any pad and it will send out a stream of notes at a tempo-sync'd rate of your choosing. As on the MPC, you can use the aftertouch sensitivity of the pads to swell the rolls in and out. The Hold button does what it says, causing a pad to sustain its assigned sample until the Hold button or pad is pressed again. 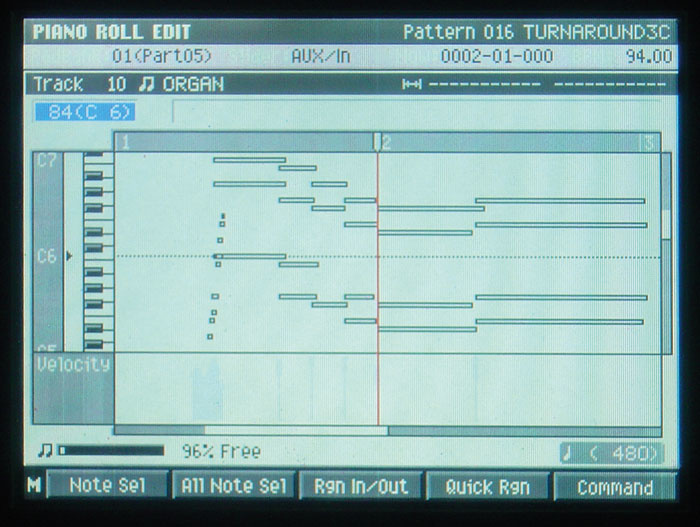 Here you can see the two graphical MIDI editing screens: the Drum Grid (right) and Piano Roll (far right) editors.Once data has been recorded, you can view and edit it via event-list or piano-roll editors, or the aforementioned Drum Grid. 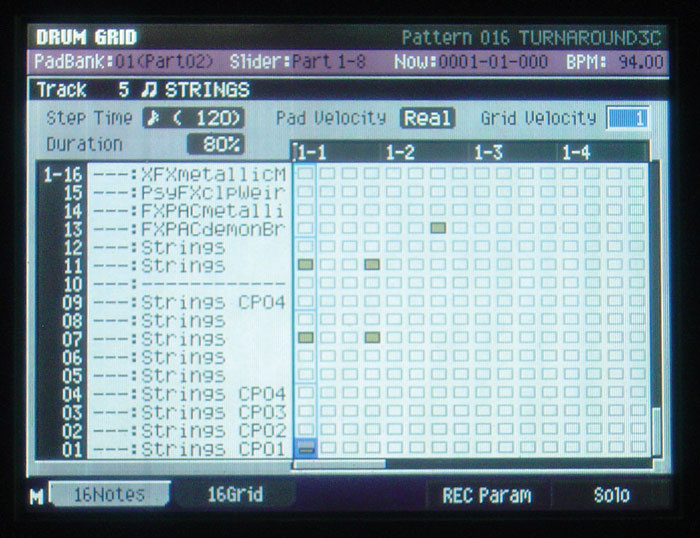 Beyond the normal cut-and-paste stuff, various bulk-editing processes are available, including duration, velocity and timing adjustments; transposition and off-line quantising; and options for creating and modifying MIDI controller curves. Something I found myself using a lot was the ability to save a section of MIDI data as a MIDI Clip, which could then be imported into any other track in the Project — really useful for moving snippets between Patterns. Although the audio tracks in the MV8800's sequencer don't work quite like those of a traditional multitrack recorder, the recording process is pretty much what you'd expect. Connect up your sound source exactly as you would for sampling, run it through internal effects if you like, and even add some monitor reverb if you're doing vocals. Then press Record to get to the setup parameters and metering, sort out your recording level, count-in, metronome settings and punch-in points (if necessary), before pressing Play to go for a take. Dropping in and out manually is smooth and quick from the transport controls or via a connected footswitch, and the loop and locators are usable enough. If you need to tidy up any rough edges, there are simple cut-and-paste editing commands, and you can refine the edit points with the same Preview To/From buttons used on Roland's VS-series multitrackers. Again, if you make a mistake the Undo button will save a single rasher of your bacon. The only thing I really missed was virtual tracks — a question of practicality here, I imagine, given that you're recording to RAM, not hard disk. I was also annoyed that the input level meters disappear when you actually start recording! 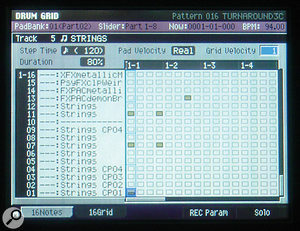 The main Pattern screen has much in common graphically with that of a software sequencer, displaying not only MIDI tracks and their contents, but also a great deal of status information about the Pattern as a whole.That's about as far as the traditional stuff goes, though, because after you've recorded your audio the recorded regions (Roland call them Audio Events) respond like triggered phrase samples. You can, for instance, open the Audio Event and edit it just like a sample (changing start and end points and adding a loop); adjust its level; reverse playback; and change pitch and tempo independently of each other, as well as synchronising playback to sequencer tempo changes. Cutting an Audio Event into bits first allows you to get fairly creative, because each resultant new Audio Event then has its own playback parameters. The only fly in the ointment is that the real-time pitch-shifting and time-stretching isn't the most transparent I've heard, so some samples will sound better matched to tempo with the Auto Chop routine or the MV8800's more hi-fi off-line time-stretching. To blur the line between recording and sampling still further, you can assign up to 512 snippets of audio (recordings or samples) to the pads as Audio Phrases, whereupon they can be played whenever an audio track is selected, in much the same way that the main sampler can be played from a MIDI track — albeit via a slightly unwieldy 32 pad banks! Audio Phrases can be looped, reversed, pitch-shifted and time-stretched just like Audio Events, and will respond to velocity. It's no accident that Audio Phrases and Audio Events have almost identical parameters, because this means that you can record triggered Audio Phrases in real time or step time directly into an audio track, whereupon they appear as Audio Events. You can even quantise your performance as you record, to make sure loops start exactly on the beat, in case your timing's as sloppy as mine! Any Audio Phrase parameters you set up before recording are then transferred to Audio Event parameters, so everything plays back as you expect. Well, actually, not quite. When you're auditioning Audio Phrases from the pads, you can play different Audio Phrases together. However, when you record an Audio Phrase performance you're not actually recording audio, but rather a series of trigger events. Once recorded into the track, the Audio Events cannot overlap, and you'll only hear each one until the next plays. If you wanted to record the mixed output of a number of Audio Phrases, you'd have to resample the MV8800's outputs while you played. Fortunately, audio tracks can resample just like the main sampler can. The ease with which you can swap audio between Audio Events, Audio Phrases and the sampler is a real strength of this machine. For example, a simple audio-editing procedure can chop a section out of an audio track and make it an Audio Phrase; and the Clipboard button will freely carry samples (and as many settings as will translate — very slick!) between sampler pads and Audio Phrase pads; so it's very simple to take a sample and transfer it to an Audio Phrase to lock it to tempo, before recording it as an Audio Event. The only down side of the MV8800's very fluid approach to using audio is that it can be a bit confusing to start with, because samples, Audio Phrases and Audio Events can interchange and overlap their functions in so many ways. The mixer is basic but functional, with its most fully-featured channels catering for the sampler's Parts and the audio tracks. These have fader and pan control, three-band parametric EQ, and sends to two of the internal effect processors, providing global delay/chorus and reverb effects. Alternatively, you can create audio groups from the output of a number of channels, controlling and routing them through one of four EQ-less Aux channels. Other than operational convenience, the main reason to do this is that one of the three internal effects processors can be inserted into Aux channels, so you could, for instance, compress all your drum samples and percussion overdubs together. Although not motorised, the set of mini sliders underneath the display are still pretty good for controlling the mixer page's faders, as they automatically reassign themselves to whichever bank of faders is currently showing on the LCD. An Assignable Slider button next to the sliders switches them to sending a user-defined set of MIDI Continuous Controller messages instead, and these can be recorded to MIDI tracks just like Note messages from the pads. You can then route these MIDI tracks to the mixer, which responds to MIDI Continuous Controller messages, to achieve basic level and pan automation. When you're happy with the mix of your track, you enter a special Mixdown mode where you can bounce the whole mix to disk as a WAV file. A separate Mastering mode then gives you further processing options before you burn the file to CD. The internal effects DSP, freed from its mixing duties, now delivers a powerful mastering effects chain of EQ, psychoacoustic enhancement, multi-band compression and limiting. Backing up Projects is easily done to CD-R or CD-RW as a data archive, something you'll have to do with all your Projects sooner or later, so that you can reformat the hard drive to avoid data fragmentation; there's no defragmentation routine. As with other large Roland units such as the VS2480, you can connect a VGA monitor and PS2 mouse (the latter supplied) to the back of the MV8800 if you want to work in a more computer-style way. I've always felt that the VS2480's screen didn't really warrant the desk space, whereas the mouse was just as useful independent of the monitor. With the MV8800, though, it's a different story. First of all, some capabilities of the MV8800 are inaccessible without the screen and mouse. Where this is most apparent is in the piano-roll editor, which doesn't allow any easy editing of individual notes when you're not using the monitor and mouse: it's pretty much just a display. Add the monitor and mouse, however, and it begins to feel much more like, say, Cubase's Key Editor, because you can manipulate individual notes directly with the mouse. Moving and editing data in the main Song and Pattern displays is a lot simpler with the mouse, too, when all you have to do is drag and drop. The other thing that's different from the VS2480 is that the mouse will not operate without the screen. I found this very tedious, because I didn't really feel the need for the screen much, but really missed the speed of the mouse when selecting, editing, and naming things — you get a little QWERTY keyboard to click on when renaming using the mouse, whereas you're stuck with furious bouts of data-wheel twiddling without it. The MV8800 makes a good impression right out of the box, exuding a reassuring air of robustness with its 9kg weight and 48 x 48 x 14cm dimensions. All the controls seem built to withstand a hammering, and all the sockets are bolted to the chassis for durability, which should help endear the machine to the live musician as well as the studio producer. I was also impressed with all the operational refinements and shortcuts of the operating system, as well as its resolutely crash-free operation during the two-month review period. All in all, this feels like a mature, trustworthy piece of kit. Getting to know the machine took a bit of time and a certain amount of head-scratching, and I think this will be the biggest problem that Roland face in targeting the MPC crowd. 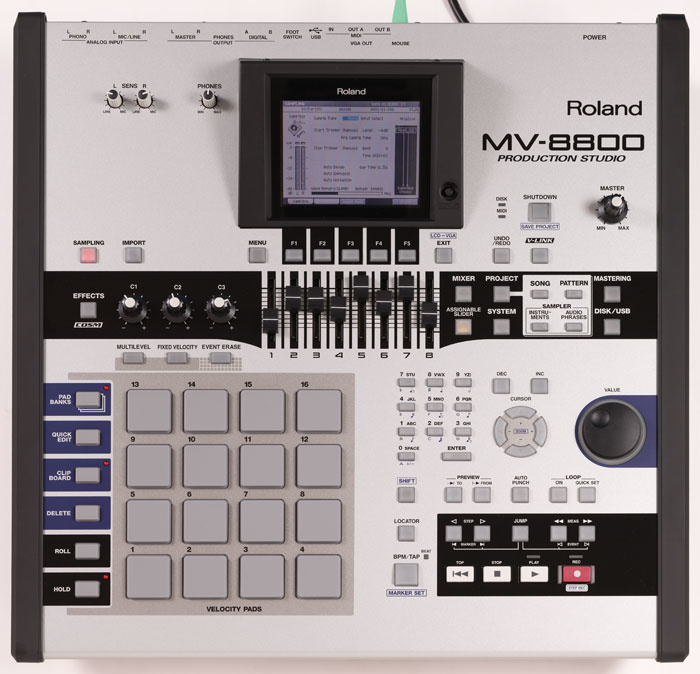 Part of the problem is that there is way more functionality in the MV8800 than in a typical MPC, but it's also because of the way samples, Audio Phrases and Audio Events interact and interchange so freely. It doesn't help that the manuals aren't tremendously helpful (not that your average MPC user would even touch a manual). All the features are dutifully explained, but I had to discover for myself how to make them work together in practice. Once you're familiar with the machine, though, I'd say that there's nothing to choose between the MV8800 and an MPC in terms of operational speed. You might even find working with the MV8800 faster, especially if you get the extra monitor and mouse involved. 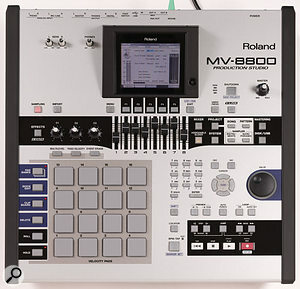 Once you have bounced down your final mix as a WAV file, you can polish the sound further using a dedicated mastering mode where the internal effects DSP offers a powerful mastering effects chain.The flip side of the extra learning curve, though, is that the MV8800 beats the living daylights out of its closest Akai competitor, the MPC2500, in terms of feature set. The main sampler is more powerful and flexible, the audio tracks and Audio Phrases are a big bonus, MIDI editing is easier, and the effects are in a different solar system. The MV8800 is a much more creative machine and integrates audio, MIDI, effects and mixing functions in a unique way that's lots of fun once you're familiar with it. Beyond the discontinuation of the MV8OP1 output expansion card in the EU, my only real complaints would be the lack of a phantom-powered XLR mic input, the fact that the mouse will only work with an external monitor, and the fact that level metering is pretty thin on the ground: beyond the aforementioned disappearing input metering while recording, the most annoying metering issues are the lack of master output metering to avoid clipping, and the lack of gain-reduction metering in the MFX dynamics algorithms. I also think it's a serious omission on a machine of this type that it won't import any of the tempo-sync'ing sample formats, such as REX2, Acidised WAV or Apple Loops. It would be great to be able to import the slices of a REX2 loop into a sampler Patch, as with the results of Auto Chop. In short, the MV8800 is an excellent machine, combining MPC-style features and reliability with bags more creative potential. I suspect, however, that it may be rather deep for the technically challenged user to get to grips with, and that Roland may not therefore erode that area of Akai's market share a great deal. As I've mentioned in the review, the main alternative to the MV8800 is Akai's UK top of the range: the MPC2500. Akai's machine has only half the polyphony, 16MB RAM as standard (expandable to a maximum of 128MB) and offers none of the MV8800's audio recording or real-time tempo-matching. The effects are also much less impressive, the internal CD drive is a cost option, and there's nothing to rival the MV8800's mouse and monitor. However, the MPC2500 is roughly £200 less expensive in the UK, includes eight outputs as standard (you need the MV8OP1 expansion for this on the MV8800), is much more straightforward to learn and has serious hip-hop cachet. Can do most of what an MPC can do, and a lot more besides. Good-quality bundled hip-hop patch library. Excellent effects facilities, with a good selection of creative algorithms and routing options. 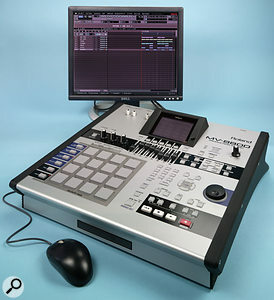 MIDI and audio functions well integrated in a single sequencer environment. Mic inputs have no XLRs or phantom power, so outboard preamp needed for recording with most high-quality condenser mics. Scarcity of metering when recording/mixing. Some functions only accessible with the optional external monitor and mouse, and the mouse only works when using the monitor. MPC users face something of a learning curve before they get the best out of this machine. EU users restricted to one stereo output, as MV8OP1 board discontinued in this region. This is an extremely well specified and hardy machine that brings a more creative slant to the MPC-style workstation concept.